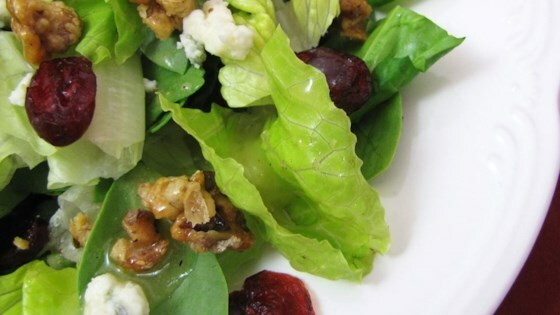 "A yummy, easy salad with candied walnuts, cranberries, Gorgonzola cheese, mixed greens, and a raspberry vinaigrette. It's always a big hit and is requested by my friends and family constantly! Even my picky fiance!" Place walnuts and sugar in a skillet over medium heat, stirring constantly until the sugar dissolves into a light brown liquid and coats the walnuts. Remove walnuts from skillet, and spread them out on a sheet of aluminum foil to cool. Place in a large salad bowl the mixed greens, cranberries, cheese, vinaigrette, vinegar, and olive oil. Toss gently; add candied walnuts, and toss again. I've made this a bunch of ways but prefer candied pecans instead of walnuts and have successfully subbed blue cheese instead of gorgonzola. Plan to serve for a Christmas dinner party. I found the secret to getting my boyfriend to eat AND love salads: CANDIED WALNUTS. Mmmmm... this was a great salad! Will make it many more times. Wouldn't change a thing about it!